I generally write tutorials related to cloud in our private wiki. Recently I realized that some of those tutorials might be also helpful to others, specially for someone who wants to get their hands dirty in this area. So my primary intention here is to write on those things which will help someone at the very beginning and will show a path to move forward. If you are already an expert in this field, this is not the right place for you. This blog is only for beginners. Happy Clouding!!! In my previous post I talked about how to: Setting up Ganglia in CentOS environment. At that time, I used only a single cluster for the whole setup. But it's highly unlikely that you have only a single cluster in your development/production environment. Consider you have two clusters - 1. Storm 2. Kafka and you want to monitor all of these cluster nodes through a single Ganglia UI. You do not have to install Ganglia multiple times for that, you just need to configure your Ganglia. It would have been much easier if AWS supports multicast but as it doesn't support multicast, you need to do a work-around in unicast mode to achieve monitoring multiple clusters in one single Ganglia. What I am going to do is, I will configure each of the cluster to send collected data (gmond) to one of their specific node only and configure the gmetad daemon in a way that it can collects the data only from a designated node (gmond daemon) from each cluster. Ganglia will categorize each cluster data by their unique cluster name defined in gmond.conf file. 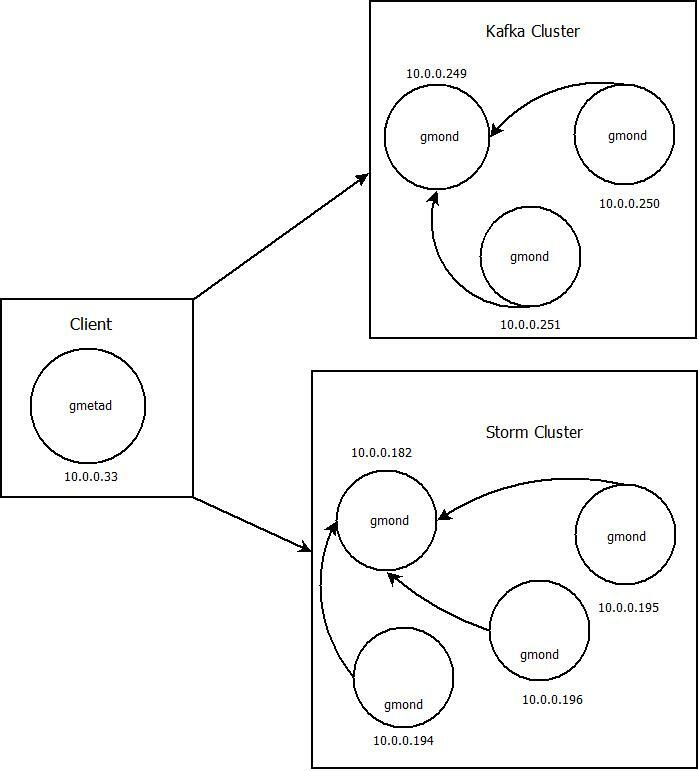 As you can see in the above figure that all Kakfa cluster's data is sending to one specific node - 10.0.0.249 and all Storm cluster's data is sending to one of its node - 10.0.0.182. Client machine (10.0.0.33) is running gmetad daemon and I will configure that daemon so that it can look for two data sources for two clusters where their source IP addresses will be 10.0.0.249 and 10.0.0.182 for Kafka and Storm respectively. I'm assuming that you already setup your Ganglia and it's running as expected. So I am not going to discuess about what is gmond.conf and gmetad.conf files. In case if you have not setup yet, you might want to take a look at this post. You are done! Now restart all gmond daemons and gmetad daemon and wait for few minutes. Once you navigate to your Ganglia UI url you should be able to see your grid and list of your clusters in the drop-down. There is another work-around which you can also try to get a better understanding of Ganglia. In that case you need to use separate port number for each cluster. Here, I'm distinguishing each cluster's data source per IP address, but in that work-around you can have a single IP address for all clusters but multiple port numbers. You can try that work-around as an exercise :). Note: For privacy purpose, I had to modify several lines on this post from my original post. So if you find something is not working or facing any issues, please do not hesitate to contact me. Gmond (Ganglia monitoring daemon): Runs on every single node and collects the data and sends to meta daemon node. Gmetad (Ganglia meta daemon): Runs on a head (or client) node and gathers the data from all monitoring nodes and displays it on UI. 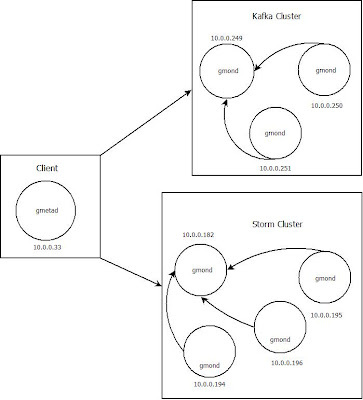 Assume I have 4 nodes cluster and one of the nodes also works as client. So, I will install the Ganglia PHP UI on that machine. --> If they are not available, then you might need to install EPEL repositories to your machine. By this point, everything is installed and now you need to configure your Ganglia. I have updated only the following part on gmond.conf file in each monitoring node. Notice that I have commented out mcast_join and bind because multicast is not supported by AWS EC2 and unicast is only the option for Ganglia. So, all monitoring nodes are sending collected data to the node (10.0.0.33) which is collecting data (nodes which is running gmetad daemon). Here I'm telling to meta daemon the name of the cluster (name should be matched to organize list of hosts by cluster) and host's IP address and port from where data will be collected from and duration (collect data in every 60 seconds). You are done! Now start monitoring daemon and meta daemon in all nodes. Tanzir Musabbir. Simple theme. Powered by Blogger.